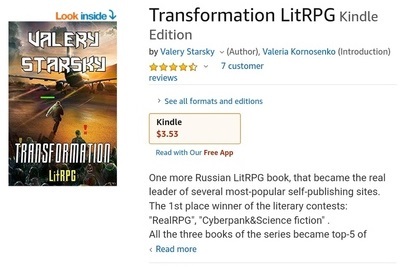 Discussion in 'All Things LitRPG' started by Valeriy Starsky, Jul 18, 2018. I’m Russian author and I came to Amazon with this my first book. Translated books are always a little bit odd. Hpwever, I’m so happy, that I’ve managed the translation and I can share my thoughts and feelings with you! But I was such a lucky guy! Thanks to my girls, who persuaded me to translate the book: Ramy, July and Val. They are real fairies! They translated my book into English. For me it’s a real magic! Great work! Congratulations! I hope it's a great success for you. I don't do FB, but I know how hard it is to learn a second language! Good that you found folks to help translate. @Paul Bellow thank you for your forum and FB group! The guys here are very good! I'm glad that I've got here! dag0net, CheshirePhoenix and Paul Bellow like this. Hello, buddies! Great news. There was a release of my book. Hope you'll it! Yuli Ban, dag0net and CheshirePhoenix like this.